I’m trying to get back on track with the Workspace and Environment interviews and I think as the season starts to change, people will be more inclined to stay inside and be forced to answer our questions. Unless if they’re around California then those guys will never get back to us! Luckily one of them did: Joseph Karam of The Locust. Enjoy! I’ve been hacking away on different musical objects since I was a kid and have always thrived on the different ways sound has affected me. When I would come across something new that bent my brain it would be subjected to my incessant scrutiny, listened to obsessively and broken down to it’s subtleties to the dismay of anyone within earshot of me. I try to take that scrutiny and put it to the task of exploring different themes and ways of writing songs or creating aural environments, always looking to tread on new musical territories. Most of what I’ve recorded and released in the last handful of years has been with The Locust. I’ve also played with Le Shok, T Cells, David Scott Stone, by myself and with various other Orders in and around the Los Angeles area. I was born in the Los Angeles area and currently live in Long Beach. The Moog Voyager and MOTM synth are a lethal combo and what I’ve used most lately. The Ibanez AD202 analog delay is up there as well (great feedback). My piano is probably my favorite and longest lasting musical friend. What are some softwares you prefer? I use Logic as a compositional tool and audio sketchpad. No real preference there, it was cheaper to get going than Pro Tools. What’s really important to me is to be able to have a space I can work in that’s free of distraction. I’ve had a bunch of different rehearsal spaces and studios and the only consistent thread among them has been that they’re cramped. In my home setup I find that having everything up, running and organized when I need it helps tremendously throughout my writing process. It depends on the project. I think the environment you’re in can influence how you write and record but I only ever think about it explicitly when it’s a project that is site specific. When touring can you explain the difficulties of touring with a modular setup? It can be a sensitive instrument and unforeseen damages are sometimes difficult to work around. I’ve arrived in Europe only to find pots damaged, screws loose and a TSA pamphlet letting me know who to thank. People always seem curious about whether the number of different variables to mull over is intimidating or not and it certainly can be when you’re working on the fly and in the middle of a set. Like most things, once you get to know your setup you learn to maneuver through it and identify problems that may arise with increasing dexterity. Can you explain the benefits of touring with the modular? It sounds great, has got a lot of power behind it and is incredibly flexible. I love hearing it through good sound systems and in strange rooms. Sometimes I’ll set up patches I’m working on just to see how they sound in a given space, or, when given the opportunity, I’ll throw something up just to see how much we can get the place to rattle. Using the modular on the road also keeps me on my toes, even when everything else has been locked down through repetition on tour. Do you create patches nightly or do you have preset patches you remember? I always work patches out before a tour. On some occasions I’ll change things up if I get tired of the flow or find that they’re not working in the set. When I have time for a decent sound check I like to try to tweak the patch to suit the room or sound system. What are your favorite modules? Current favorites: MOTM 410 (Triple Resonant Filter), Encore Electronics Frequency Shifter, Zeroscillator, MOTM 480 VCF, Blacet Time Machine… They all sound great and satisfy certain cravings I’ve recently had. There has always been a piano in my house and I’ve had various Casio keyboards when I was younger but the first synth I bought later in life was a Crumar Performer. It was initially used when I joined The Locust and was later put into service by Darryl in Le Shok, where it sustained many, many injuries before it was finally retired. My most recent addition to the MOTM is the 480 VCF. Not really. I have a PreSonus Firepod I take with me when the occasion arises. I used to drag a Tascam 58 around with me. I still have back problems. In the last year or so I’ve traveled with the Voyager, a 1 or 2 row cabinet of MOTM modules and a rack case with odds and ends (CV Expander, AD202…). How many workspaces have you had? I’ve had a handful in the last 10 years from a Juno 60 and a four track in a trailer I lived in to various garages, rehearsal spaces and bedrooms I’ve occupied. 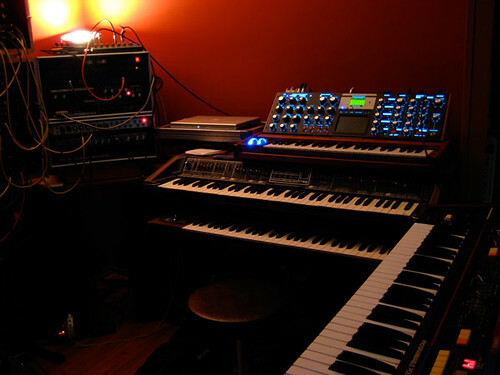 Early on my home setup was mostly based around a few synths, an E-mu Drumulator and two different ½” 8 track machines I would alternate between. When I started building the modular my emphasis shifted more towards exploring its use and capabilities. My current setup has been the most functional, allowing me to keep a decent stock of equipment at my disposal. My focus in the last year has shifted to writing and I feel like my current space reflects that, but change is always looming and as my priorities shift my spaces tend to do the same. No, but I’m always open for a good gig.